Everybody has a view about concrete, but few of these views are exactly the same: there is no material so contradictory and complex in its application and meaning. I myself became fully aware of concrete’s contradictions in Brazil, latterly accompanied by Forty’s edited book on the country’s modernist architecture (Brazil’s Modern Architecture, 2007). I had never seen so much concrete. But equally I have never been confronted with such a disjunction between aspiration and application. Standing outside Oscar Niemeyer’s MAC art museum in Niteroí, it was impossible to square the MAC’s futuristic form (a flying saucer) with the crudeness of its execution (all cracks and, lumps, like a primary school project). That contrast was really quite disturbing, as the official photographs of the MAC depicted a building of otherworldly sleekness whose construction was a mystery to earthly folk. I was alert to concrete’s contradictions from that point on. Concrete and Culture deals precisely with those contradictions. It expands the thesis Forty set out earlier in Brazil’s Modern Architecture about another iconic building in that country, Vilanova Artigas’s Faculty of Architecture and Urbanism (FAU) at the University of São Paulo (1968). A giant concrete box on stilts, it is both exceptionally sophisticated as engineering, and exceptionally crude in finish (its surface these days is so decayed, you can easily mistake the building for a ruin). Forty argued that this tension was uniquely bound up with concrete itself, and was wholly intentional, a way of making public a set of anxieties about Brazil’s development at the time. It is simultaneously rich and poor, sophisticated and crude, old and new. The argument about FAU is expanded here to make a thoroughly global thesis about concrete’s contradictions. It is one of the key symbols of modernisation, but found naturally, and used by the Romans; it is an industrial material, but also a natural one; it is supposed to lead to efficiencies in the building process, but is dependent on a lot of low-grade physical labour; it connotes modernity in one place, historicity in others; it is simultaneously liquid and solid. And so on. The book is organised around five key oppositions, represented in suggestively-titled chapters (‘Mud and Modernity’, ‘Natural or Unnatural’, ‘Heaven and Earth’, ‘Memory and Oblivion’). Other chapters explore concrete’s complex geopolitics, its equally complex relationship with industrial labour, and its representation in photography. Even concrete’s fiercest detractors would be hard pressed to deny its photogenic character, especially in monochrome at high ASA ratings. And as Forty argues, there are material similarities between the processes of building in concrete and taking a photograph. Film is a key reference point too: there is a compelling account of the dry concrete bed of the Los Angeles river as a setting in John Boorman’s Point Blank (1967). Forty is particularly good in showing how a particular material detail might represent ideology. In the case of FAU, it’s the building’s strangely attenuated column give the impression of colossal weight supported by very little, a metaphor for Brazil’s underdevelopment. On the Economist Building in St James’s, London, familiar to British readers he alights on a tiny detail: at the base of the columns holding up the Economist tower, the Portland stone cladding is intentionally stopped a few inches from the ground, a ‘Brechtian trick’ in the words of the architects, making visible the structure. It is a ‘demure lifting of the skirt to reveal a glimpse of ankle’ writes Forty, a joke (he argues) you would never find in American concrete. On BBPR’s highly eccentric Torre Velasca (1958)in Milan, Forty writes of the subversion of the modern tower form. This one, with its rough, and now weather-stained surface and its bulging upper structure recalling the form of Renaissance palazzos, suggests a building as much of the past as of the future, in marked contrast with American skyscraper design. Here again is the contradiction of concrete in relation to history: a supposedly modern material here used to signify if not antiquity, an accommodation of the past. One chapter, on labour, departs from the general focus on the aesthetics of concrete. Here Forty makes clear the sheer amount of physical effort involved in concrete constriction. Again, I had myself reflected on this in relation to Brazil, where I recalled the communist architect Sergio Ferro’s account of the building of Brasília. Ferro detailed not just the long hours, and the brutality of the organisation (both well reported) but the peculiar horror of working with the steel reinforcing rods, their tendency to scrape and gouge limbs. 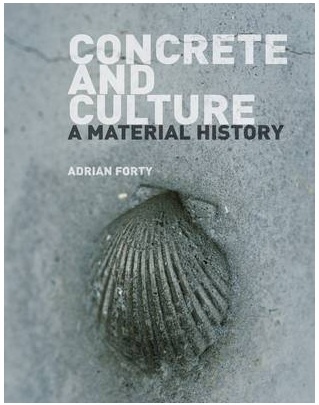 Forty sets out a range of evidence to argue that the use of concrete allowed the building process to be broken down into a much wider range of unskilled tasks, which in turn meant a greater possible reliance on cheap labour. Concrete explicitly didn’t mean automation, or prefabrication, but the strange sublimation of what were essentially craft skills. He reproduces an extraordinary diagram from 1912 by Frederick Taylor and Sanford Thompson detailed every stage in the manufacture of ‘anything’ in concrete. The table reproduced covers the mixing of cement, listing the time taken to cut the string on a bag of cement (0.11 min), ‘moving the bag about 2ft.’ (0.08 min) to lifting the bag of cement to the shoulder (0.30) and several other actions. The detail is mind-boggling. Reproducing it in the somewhat effete context of architectural history gives it the whiff of conceptual art (routine process repeated to absurdity, then documented). But it also makes clear the contradictions involved in concrete construction: a process commonly thought to save on labour compared with traditional forms of building in fact does nothing of the sort; and a process equally commonly thought to be advanced turns out to be dependent on the most rudimentary skills. Taylor and Thompson’s diagram in essence is the book’s argument: what is supposed to be modern, isn’t – and its irrationality borders on the surreal. The last chapter of the book, ‘A Concrete Renaissance’, surveys the now-familiar revival in concrete’s fortunes in the world’s rich countries as a material for buildings whose clientele both understand and appreciate its contradictions. Peter Zumthor’s extremely refined work makes use of concrete’s rough character for aesthetic effect. The images here index what’s survived: the LCC architects’ South Bank arts complex, Bo Bardi in Brazil, Alvaro Siza in Portugal, Peter Zumthor in Switzerland. What has survived, and revived in these refined contexts is concrete as aesthetic rather than structure; it’s valued for what it looks like, much less for its structural qualities. Its capacity to stain and degrade has become a value, not a flaw (see also Herzog and de Meuron’s Rudin House, which looks permanently drenched).Forty is right to point to a renaissance of concrete’s fortunes in Europe, where a taste for concrete is now, at least in some circles, an indicator of cultural refinement. Concrete’s contradictions, explored in such depth in the book, are now, in Europe, its defining characteristic. Its flaws are cultivated; to appreciate its difficulties is a sign of taste. Of course this is a minority, essentially avant-garde taste: it can only build cultural centres and privately commissioned houses, no longer mass housing, schools or hospitals (or if it does build these things it must be hidden from view). What Forty doesn’t discuss, nor to be fair, try to, is the cultural understanding of concrete in those places where it is most physically present. The ‘culture’ of the title is the culture of the rich world; he acknowledges that most concrete building actually exists elsewhere. In rich northern places, to build with concrete is a special sort of poverty chic. But in the global South, concrete carries quite other connotations. In Brazil, a country with a particularly acute concrete habit, concrete connotes everything. In Mendes da Rocha and Bo Bardi, it’s the avant-garde material, that looks outwards and backwards to Europe and European modernism. In Niemeyer’s work, it’s modernism again – but it’s also a way of making a curve that stands up. But it’s also the material of choice for Brazil’s ubiquitous high-rise condos and equally ubiquitous favelas, in both cases simply a way of making buildings strong and cheap. The same is true of Peru, and Pakistan to greater or lesser degrees. The anxieties about concrete that Forty describes so well are largely those of a world that has a choice about whether or not to use it. For the rest of the world, it means what ever it has to. This entry was posted in architecture, Brazil and tagged Adrian Forty, Architecture, Brazil, concrete, creative city, Reaktion Books, Rio de Janeiro, Sao Paulo by Richard J Williams. Bookmark the permalink.